The future is on display today in Japan, where retail workers will work alongside a talking humanoid robot to welcome customers at a major department store. The android’s name is Aiko Chihira, and her job as receptionist is to greet shoppers as they enter the shop, give them directions, and make conversation with pre-programmed scripts. Chihira can blink, blow, move her lips when she talks, and make other lifelike (albeit pretty stiff and choppy) expressions and movements powered by 43 motors. The machine is made by Toshiba in collaboration with Osaka University Intelligent Robotics Laboratory. 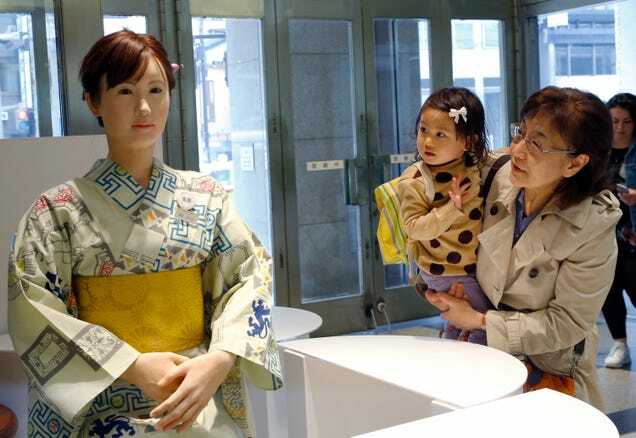 And while it’s not the only retail robot—Nestle “hired” a robot named Pepper to sell coffee makers at shops in Japan—it’s certainly the most realistic. At least, for now: Japan’s much-hyped hotel staffed almost entirely by humanoids is set to open on July 17th. Chihira’s real value, however, isn’t really as a skilled receptionist; it’s as a publicity attraction: Come for the humanlike talking robot, stay for the spring styles.